“Concerts” are a niche activity within the broad spectrum of music-making in human societies. Generally I find them a necessary evil, but with the festival of the Proms getting under way today (daily for the next two months), as usual I’m all agog (yes, a Complete Gog) for my favourite concert series. 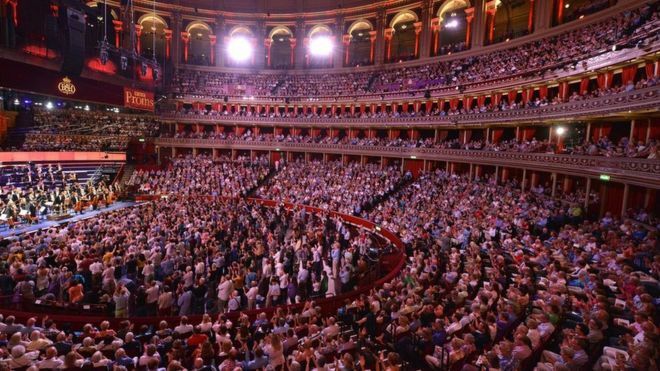 Critical of concert halls too, I’m more than happy to settle for the Victorian setting of the Albert Hall—round buildings have a distinctive ambience, and the unique receptive atmosphere of the series is largely attributable to the Prommers in the Arena. That’s F hashtag minor, not A flat miner, you note. This entry was posted in drôlerie, humour, language, WAM and tagged Proms. Bookmark the permalink.